Still Haven’t Tried Flywheel? Here Is What To Expect! 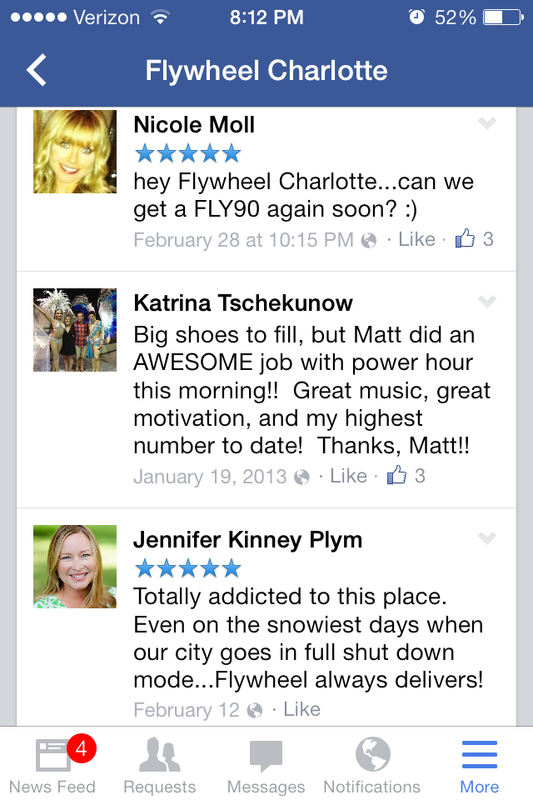 If you have read the “About” section of my blog, you know that I am an instructor at the Flywheel Charlotte location. I started as a rider when there were less than ten people in each class. Since becoming an instructor, I have watched the studio sky rocket. 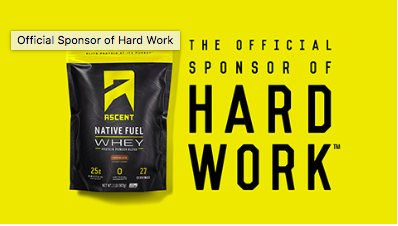 The people who try it love it, but there are still several individuals that haven’t checked our studio out. Paying on a per class basis has its positives, and I am here to share with you what you should expect when signing up for your first Flywheel class. First things first, your first class is free! 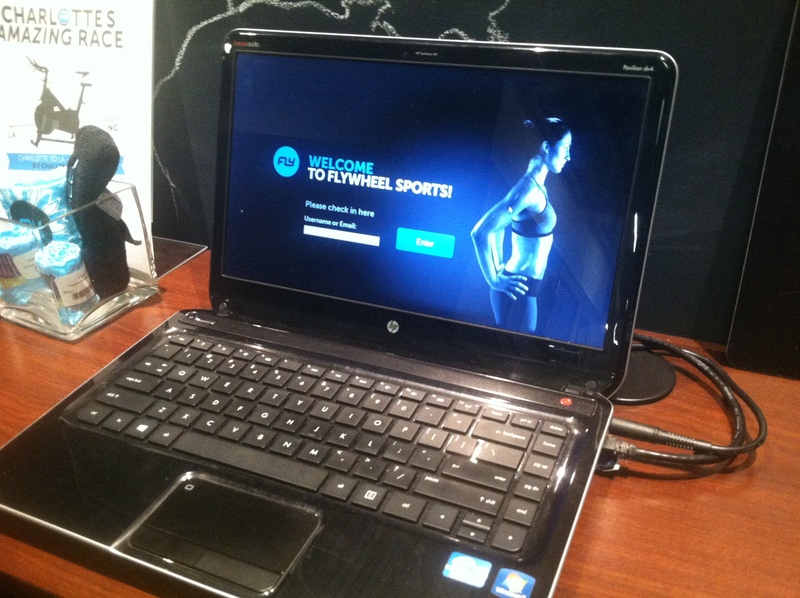 Log onto the website (www.north-carolina.flywheelsports.com) and create a user profile. This will automatically give you one free ride credit. To reserve a class, click on the reserve drop down menu at the top of the menu bar. The schedule above will pop up. Each week, the schedule is opened up at 5:00 PM on Sunday night for sign ups. That’s right, you can sign up for a specified bike any day of the week as early as 5:00 PM on Sunday! Classes are listed by instructor, date and time. Once you decide what class you want to take, click on the box of the desired class time. A stadium map will appear (see picture above). Reserve your bike by clicking on the bike that you would like to ride on. Keep in mind that all lights are OFF in the classroom during class except a spotlight on the instructor. 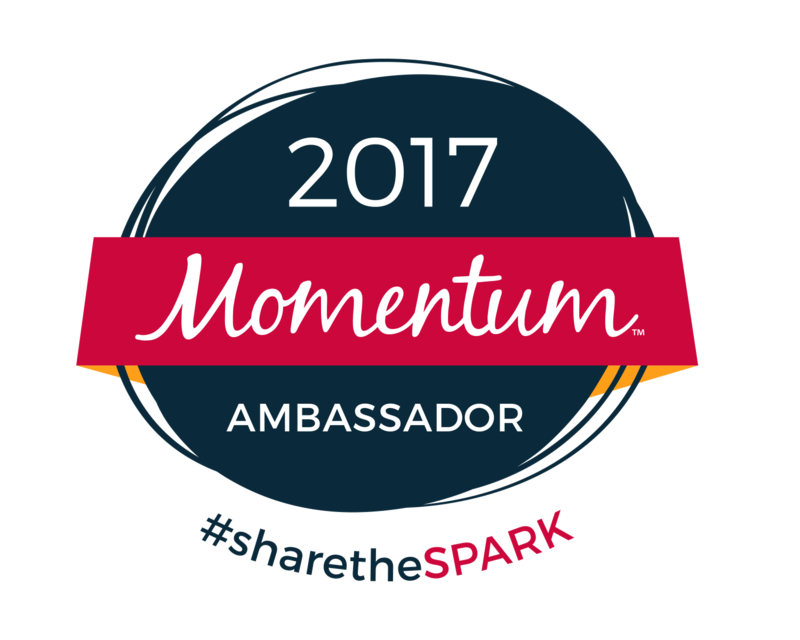 Once you have signed up, the only other thing that you need to do is show up! Don’t be nervous! It is probably good to show up 10-15 minutes early for your first class. You will be greeted by a smiling staff that will explain the check-in process, where the lockers and bathrooms are, and finally introduce you to someone that will help you set up your bike and get comfy. I mentioned “checking in”. Upon entering the studio, you will notice a huge blackboard that is decorated to represent something going on in the studio that week, along with the current week’s schedule. 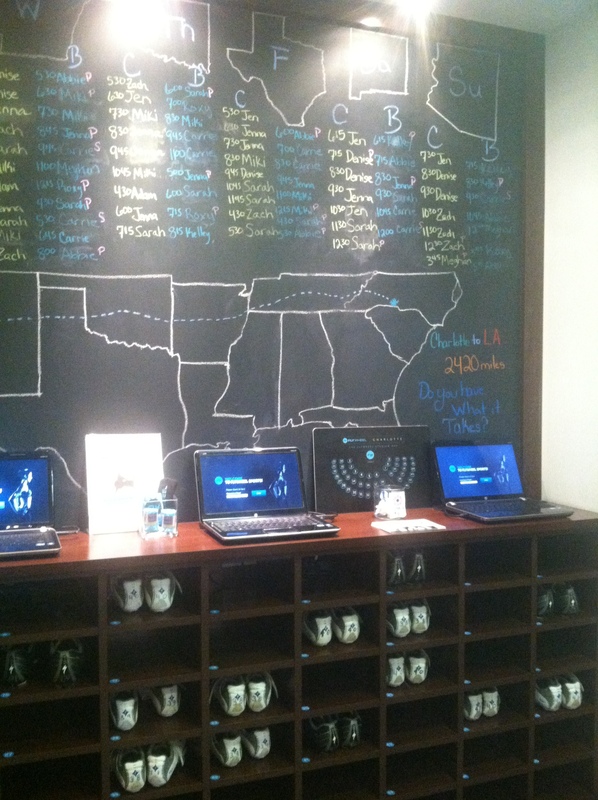 You will also notice three computers that are set up for “check-in”. To “check-in” enter the username or email that you used when signing up for your first class in the log in box on the laptop and hit enter. You will be prompted to confirm your bike number and whether or not you would like to be on the torqboard. I will explain the torqboard later in this post. Below the “check-in” computers are cubbies that are numbered. When you set up your user profile for your first class, you will indicate your shoe size. Prior to arriving for class, that friendly staff pictured above, will slide your shoes into the number cubbie that is associated with the bike that you will ride. 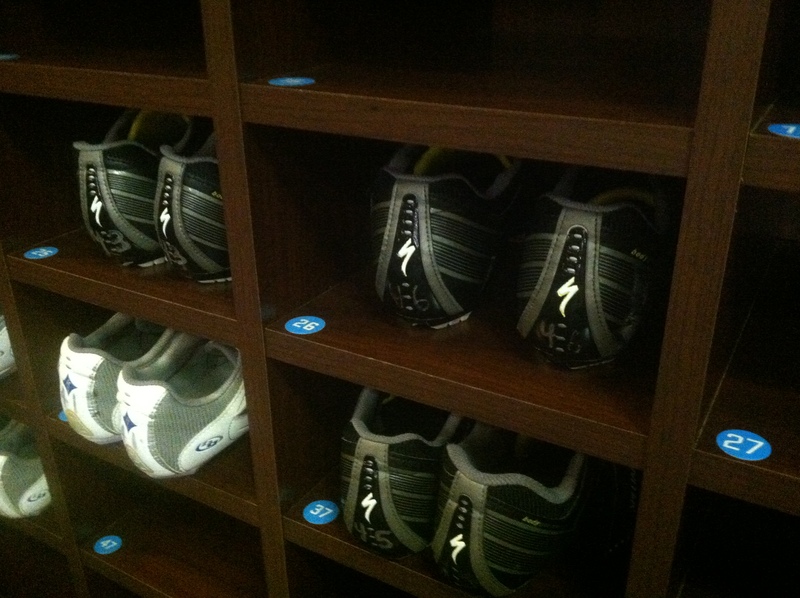 After you check-in, grab your shoes (you can also bring your own!). You can’t ride the Flywheel bikes in sneakers, so you will have to change shoes. What do you do with your stuff once you are checked in and have your cycle shoes on? 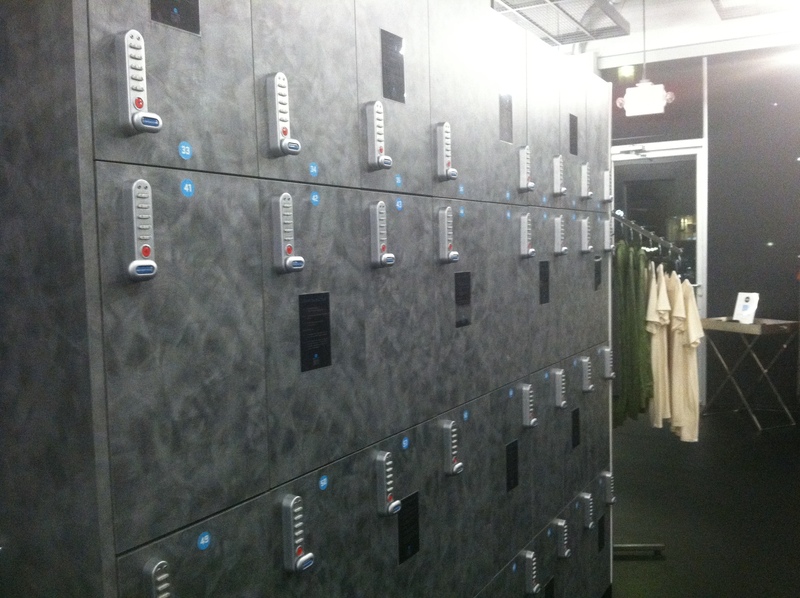 Flywheel offers free lockers. The studio prefers that you do not bring anything into the cycle stadium other than towels and water, so the free secure lockers are another positive to riding here. With the tap of four numbers on a key pad, your things are locked up (don’t worry, if you forget your code, that friendly staff can help you retrieve your stuff!). I mentioned towels and water being allowed in the studio. 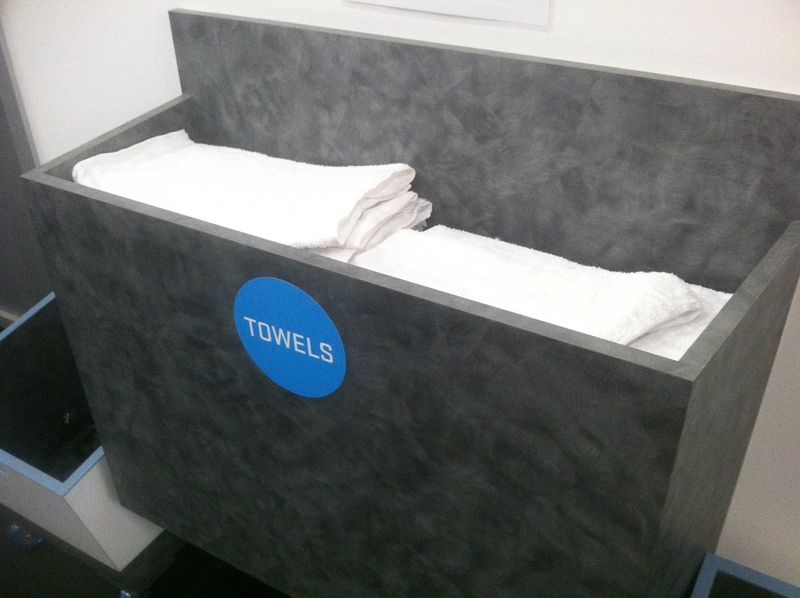 Flywheel even offers complimentary towels. Grab one on your way into the studio. 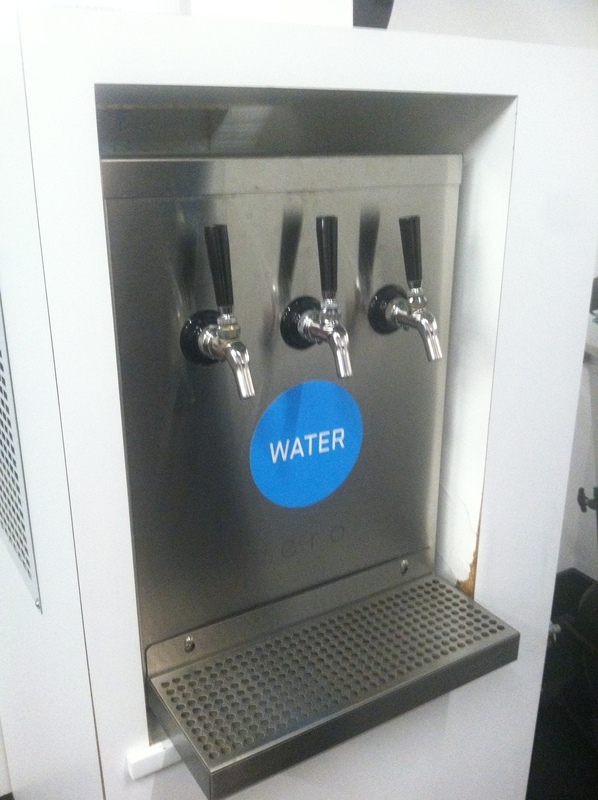 There are water refill stations located outside of the studio if you bring your own water bottle. However, if you forget a bottle, don’t worry, you can buy a bottle up front! You are checked in, and now you have your towel and water, let’s ride! 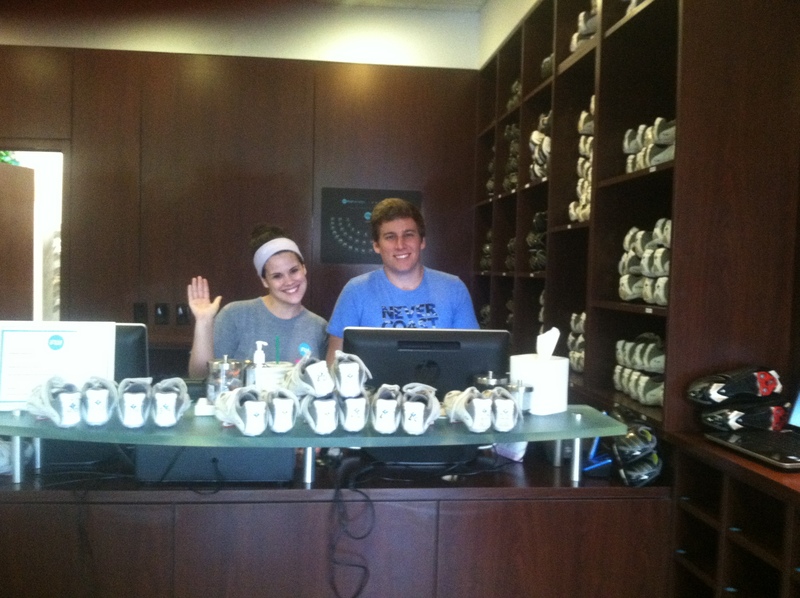 If you are unfamiliar with bike settings, Flywheel has staff on hand to help you set up your bike. 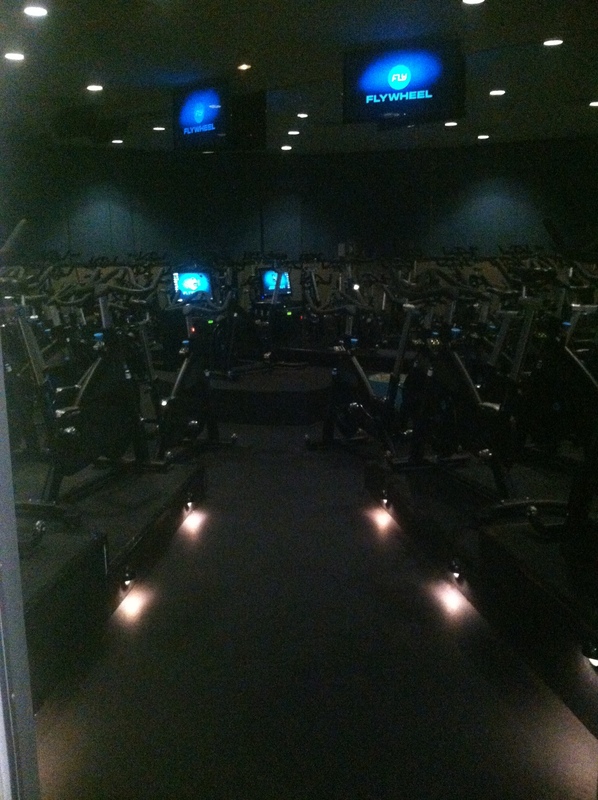 Upon entering the studio, you will notice a lighted corridor leading up to the instructor bike. Each row is elevated to resemble a stadium. Two television screens are mounted on each side of the instructor bike to display the “torqboard”. Staff on hand can help you find your specified bike. A blue sticker with a bike number is located on the front of each bike. Let’s talk about bike adjustment. You can adjust the seat up or down, bring the seat forward or back, and adjust the handlebars up and down. For comfort, gel seats are offered for those that choose to use them. There are also two weighted bars on each side of the front of the bike (a 2 pound and 4 pound bar). About three quarters of the way through the ride, there is an arms segment, in which you will be asked to use your bars to complete a series of upper body exercises (think biceps, triceps, shoulders). Torq – Resistance at Flywheel. That’s right, at Flywheel we assign a number to your resistance. No more 1/4 turn, 1/2 turn. We give you a range of torq to work with at a given RPM. RPM – Revolutions per minute. Current leg speed. 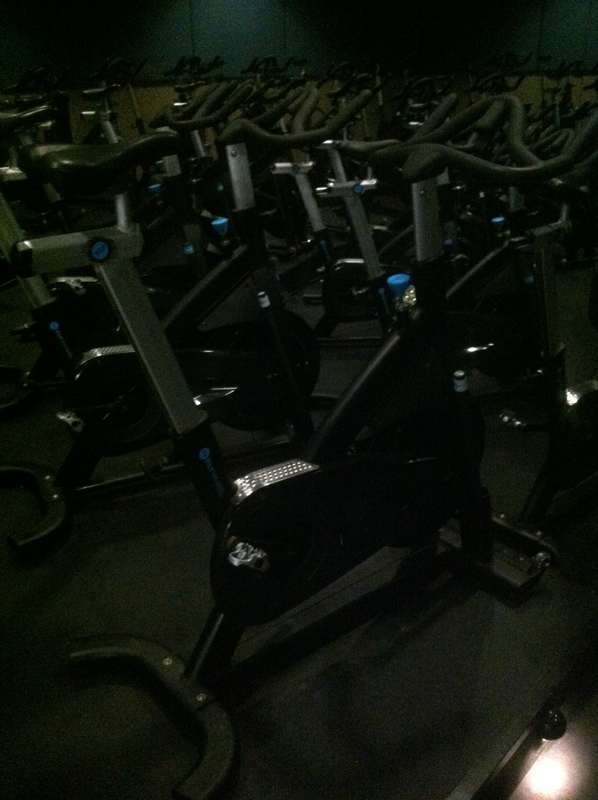 Your instructor will cue RPM’s based on the beat of the music. Current Power – Current power generation at specific period of time. 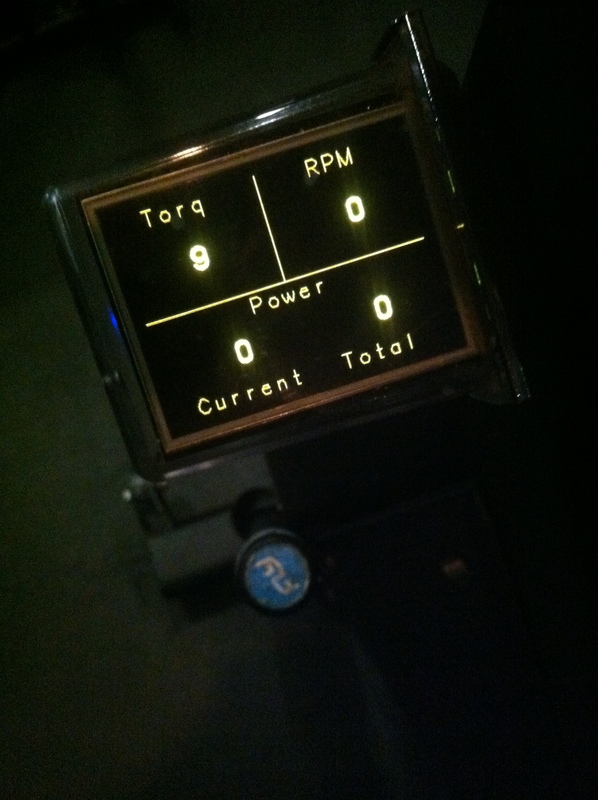 You will notice that this number will fluctuate based on changes in Torq and RPMs. 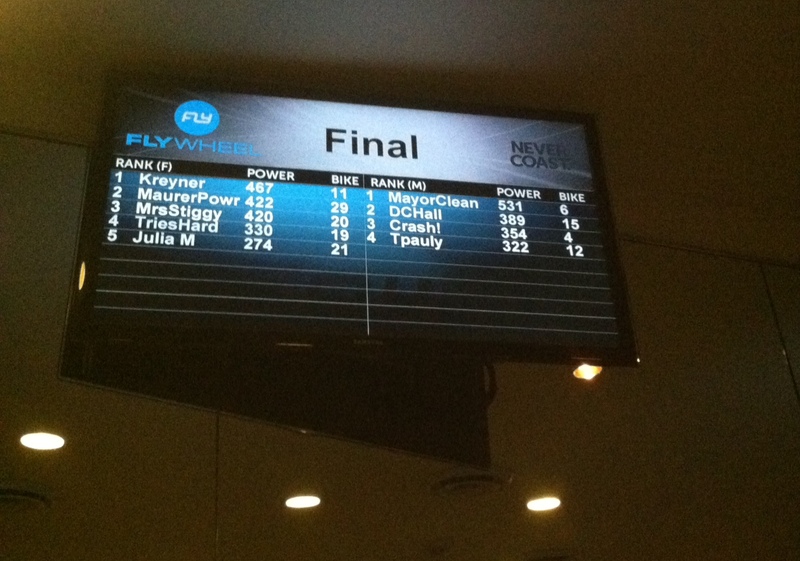 Total Power – This is what Flywheel is all about. Total Power is total accumulated power during class. This is a building number that is used to track your total power during the class. Don’t get excited and try to add to this number before class starts, total power is reset when the instructor starts class. While we are talking about Total Power, let me explain the torqboard. Should you choose to go on the torqboard (which you should! ), your total power will be displayed at specified times in class to show where people stand in class. Essentially it is a power race. Speaking of races, your instructor can also start short races in class to display on the torqboard. If you can’t win the class race, try to win a sprint race during class! After class it should be evident why so many people get addicted to this workout. There is no reason to be afraid. I have met some of my good friends through this amazing studio. The competitive atmosphere, mixed with all of the fun ways that the studio works to bring people together fosters relationships. This entry was posted in Staying fit, workout and tagged charlotte, flywheel on June 20, 2014 by flyjenduf.